I share her passion to experience new trails across Bruce Trail lands. I began to think about my personal dreams for 2018 hikes, and thought immediately of the recent acquisitions. After all, the BTC dream is to secure the entire trail length off-road and onto the optimum route. As soon as a new acquisition is concluded, trail volunteers quickly try to open a reroute that will reveal the spectacular beauty of the Escarpment. The largest land donation ever received by the Bruce Trail happened in 2017. 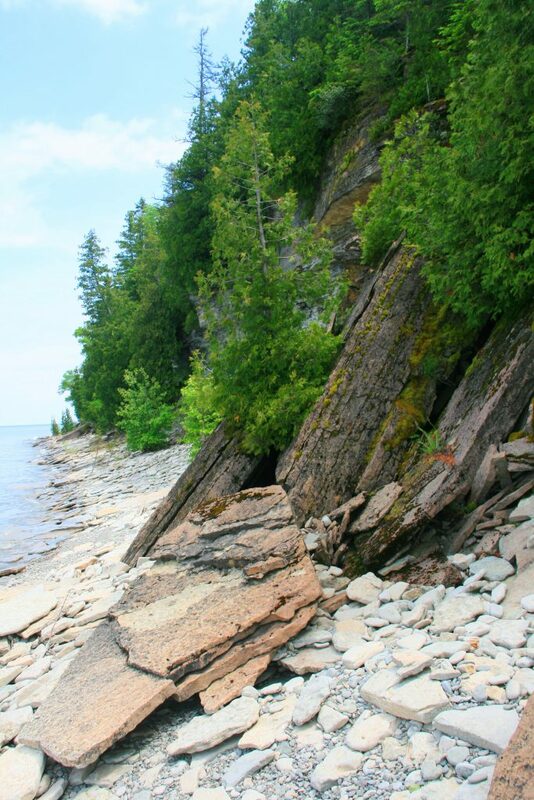 It was the Cape Dundas Nature Reserve in the Bruce Peninsula, between Hope Bay and Barrow Bay. The owner (who requested anonymity) knew that he could receive a large sum from its sale, but his dream was to preserve the land’s natural beauty in perpetuity. Thus, he chose the Bruce Trail as the recipient of his generosity. This section is not a newly built trail; the map in the 29th Trail Reference is correct. (See map 37: note the parking area near km 53.6) This loop is also one of the “Introductory Hikes” in the Trail Reference: p. V-10. Read that description. Two tips to make your hike even more enjoyable: sit on the bench at the scarp edge overlooking Georgian Bay, with the view out to Barrier Island; and climb down the staircase at the northeast end of the loop and then sit on a log and enjoy a snack beside the crystal-clear waters. My hiking goal for the Sydenham Club is trail completion in the Kemble area where a series of purchases and a new handshake agreement will result in new main Trail. This trail change will get hikers 6 km off road and a road allowance badly scarred by all-terrain vehicles. The central core of this area is Kemble Rock, where new trail was opened in 2017, winning the club the Tom East Award for the BTC’s best reroute. Park at km 138.3 (map 34). Also to the west and south of the Kemble Rock Nature Reserve, two more acquisitions were concluded as a result of fall 2017 fundraising efforts. Sometime in 2018, white blazes will open this route which will lead south to Concession Road 20 . The achievement of this reroute will remove the main Trail from one of its ugliest stretches of road and road allowance, and open up spectacular perspectives on varied Escarpment country. It is connecting properties such as these that make a giant step for the Trail in achieving a protected natural corridor. Of all the clubs, the Beaver Valley club in the past decade has done so much to acquire the optimum route, basically as a result of a strong local leadership. In 2017, they opened Trail on the Daphne and Gordon Nicholls Nature Reserve, just north of Grey Road 40 (see map 28). The Nicholls were long-time supporters of the Trail, and their generosity allowed the securement of this route. Formerly the main Trail hiked for long distances on the Old Mail Road and Grey Road 40. Now we have an off-road conservation corridor of about 14 km, almost completely secured from Webwood Falls (km 100.7) to the club’s western terminus at Blantyre. For a day hike (without a second car), I suggest parking beside Grey Road 40 and hiking north to Griersville Rock where the Trail crosses Grey Road 7. A return hike will be about 7 km. With two cars, a full day’s hike could link Webwood Falls and Blantyre. In 2017 the Blue Mountains Club opened a 1.7 km reroute on the Dunedin Ravine Nature Reserve (see map 21: beginning at km 8.0 approximately). I have yet to walk this route but have been told that the hike along the stream is beautiful. You may feel that a drive from your home to this new section of trail is too long for a short hike, but why not include some near-by sections of Blue Mountains trail that I find spectacular? 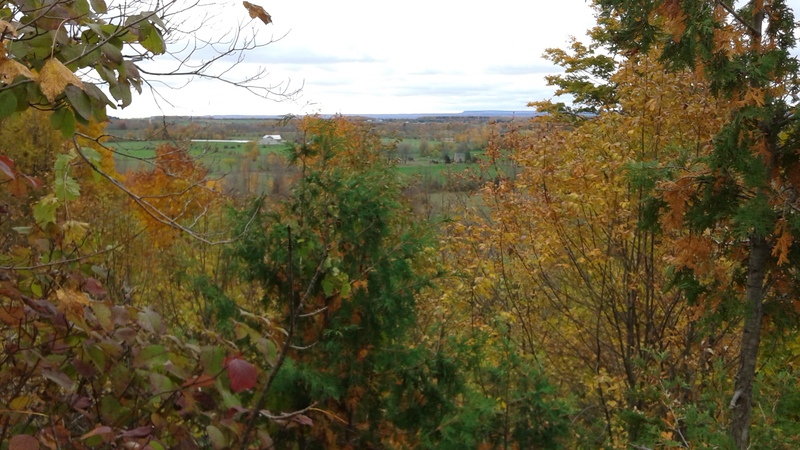 Continue driving north on Concession Road 10 to where the Trail enters the Nottawasaga Bluffs Conservation Area. Here there is a series of trails, but my favourites are the Keyhole Side Trail and Freedom Rock and the Best Caves. Or with enough time, drive north to the Pretty River Valley. If you have time, hike the Pretty River Valley Side Trail loop that passes a beautiful kettle lake. In the early days it was called Sundown Lake but the name has inexplicably been deleted from recent Guidebooks. The achievement of the Dunedin Ravine is, I hope, the start of an aggressive acquisition program within the Blue Mountains club. 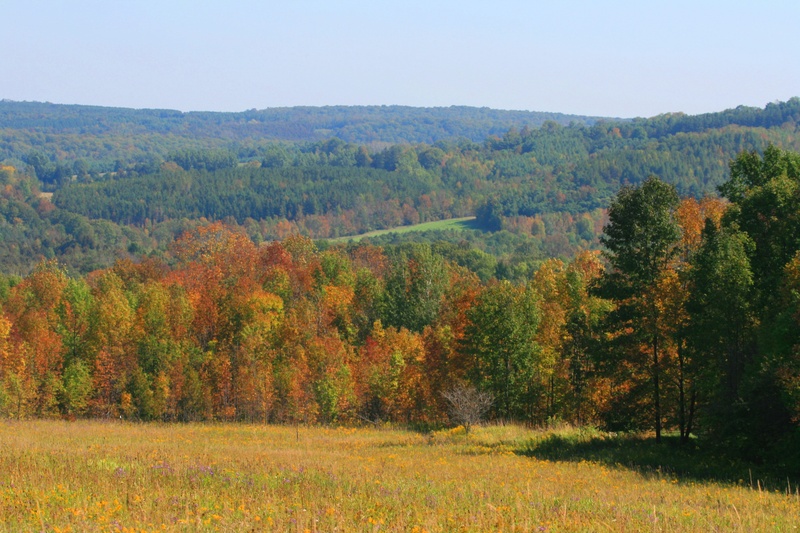 The dream to secure a Conservation Corridor along the Niagara Escarpment is now almost 2/3rds completed. 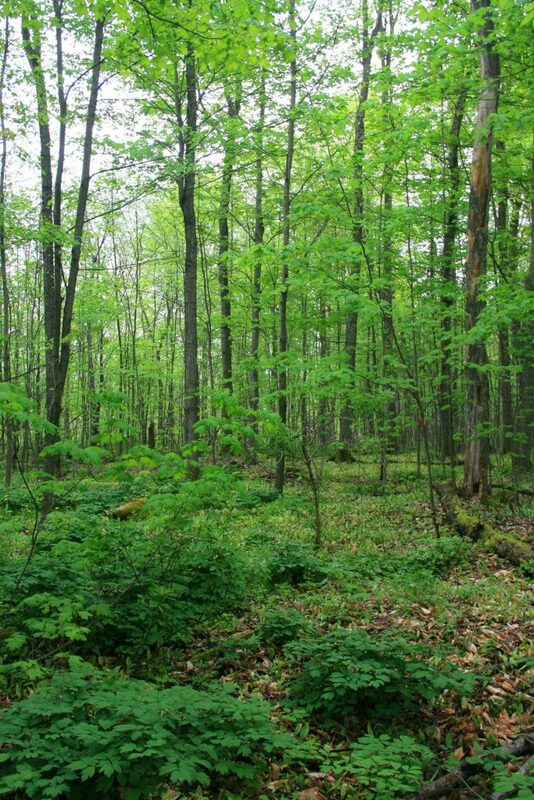 The first land acquisition by the Bruce Trail occurred in 1976 with the purchase of the Ken Young property in the Beaver Valley. When I get frustrated about the pace of acquisition, I am reminded that it took almost 40 years after the purchase to place the main Trail on the Young property! In about 1999, the BTA Board made its mission the securing of a Conservation Corridor, and its initial marketing slogan was to “realize the dream by 2015.” Obviously, that was not achieved, but this past year I did hear one BTC executive member state that he could visualize the dream realized in 20 years. I doubt I shall be around to see that achievement, but I know that some day it will happen. NOTES: All map references are taken from the 29th edition of The Bruce Trail Reference. Note that three of the four suggested trails were built after last year’s publication and are therefore not included on the maps. The best ways to keep abreast of trail changes is to Google “Bruce Trail Reroutes” or to bookmark the BTC’s Trail Reroutes webpage. Each club is responsible for reporting each reroute as soon as it is opened and blazed. These are listed on the web before they can be posted in the Bruce Trail Magazine. Donor hikes are sometimes scheduled for properties not yet opened, but please remember that large groups of hikers on these lands before a trail is constructed can result in irreparable environmental damage. Please wait until the blazes are painted. Another tip: before you head out on a hike, and if you do not have the latest edition of the Bruce Trail Magazine or Trail Reference available, another option is to purchase the map for the area of your hike @$3.00 each from the BTC website. Excellent blog! It makes me want to visit every new acquisition! Thanks Ross!